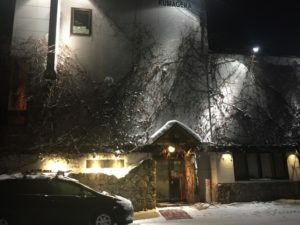 Furano hits (mostly) the culinary spot, so if you like Japanese food you’re in luck. If not, you’re in deep trouble, bring your vegemite. 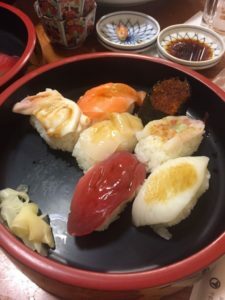 It is a noodle area, you’re not going to be eating norimaki rolls (people call them sushi rolls) or sushi (fish or other delights on top on rice) on a daily basis, although you can find these at ‘sushi restaurants’. 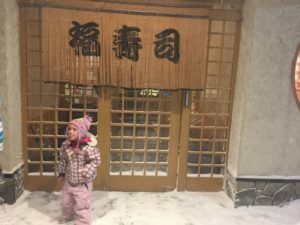 The local plentiful meals are more soup-based noodle meals and katsu and fried dishes, especially because you’re visiting in the middle of freezing cold winter and it’s in the mountains. You’re not going to get the cold food. consider yourself a flexible person. Fortunate for me that my youngest is a night owl. If you have a baby with you, a sick child back in the hotel room , you are exhausted from skiing or just don’t feel like heading out, beware. If you despise tackling language barriers and hit-and-mix experience of whether restaurants are booked out you may be better off skiing in Canada, USA or Australia. What I mean is: there is almost zero concept of home delivery. I did cry out a couple of times mid-trip “I just feel like getting a pizza delivered to the hotel and staying in my pyjamas!” but there was really nothing I could do about it. I hope your knees and back are up to sitting on the floor. 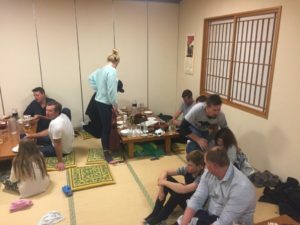 Don’t get me wrong, I speak Japanese, most of the time I called to book ahead, I used taxi-driver and hotel concierge recommendations and truthfully, I enjoyed the opportunity to chat with locals. The food was good, apart from feeling ‘noodled to death’ eating in the same two mountain cafeterias each day. 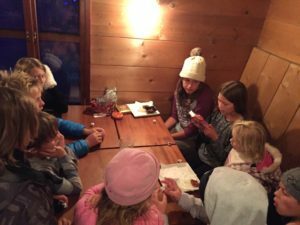 It’s just that on a ski trip with kids crying because they’re tired from skiing all day, SOMETIMES you beg for it all to be easy. 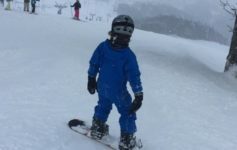 Ski trips with children generally don’t top the ‘easy travelling’ charts. But there’s ways to make the difficult a little easier. Manage Your Expectations. This is sushi and not all places serve it. Don’t laugh, I know at home we wouldn’t DREAM of feeding our families from a fast food ‘petrol station’ style establishment. But you can only find donuts, cold sandwiches and overheated sausage rolls at home in places like that. In Japan you can source bento boxes (meal boxes with rice, fish, chicken and salad covering all our major food groups. You can buy nigiri (little triangular sushi) with tuna wrapped in seaweed and healthier options than deep fried. And around the corner from our hotel it was out most convenient option (twice). Once when we were packing to go home, another time when we were headed to the night festival, waiting for a bus outside with rumbling bellies. The town hasn’t caught up with the demand, thus establishments could do with more staff, the same way resorts load up staff back home during snow season. The culture (shock horror) still expects the dining experience to be a full experience of anticipation- pleasantries- enjoyment. 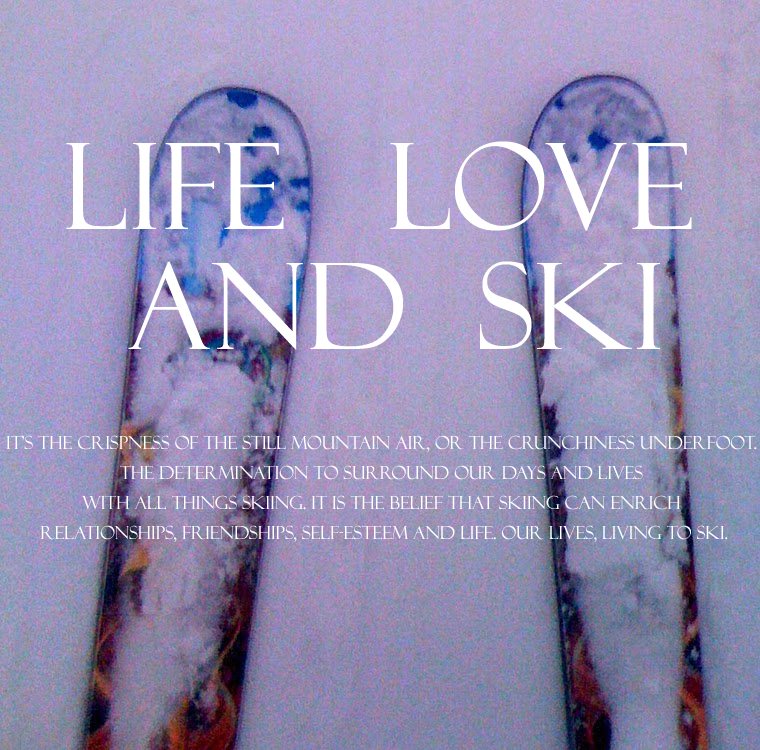 Not ‘get in and stuff ’em in’ , like people skiing and boarding all day tend to do. Isn’t it amazing how civilised we can be when we’re not starving. Pizza quota high on this trip. Veggies once we get home…. We are used to the menus enticing us with brilliantly worded temptations. We like ‘a ecologically sourced green salad made with the finest organic ingredients collected on a full moon from the lee side of the hill’ , we’re used to that. Even our local RSL club can make a burger sound like something Kim Kardashian designed. 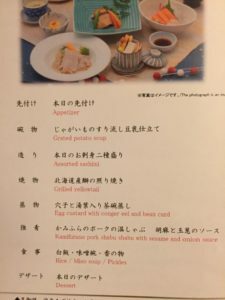 So, even if the Japanese menu is hit-and-miss descriptively you can largely expect the food to come out delicious and tasting so much better than they sound. 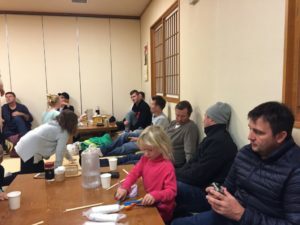 With kids, a safe option can be katsu, spaghetti, pizza or gyoza. Remember to bring a toy or other amusements if you have little kids with you to offset potentially slow service and keep their feet off the seats. I found a simple notepad, sticker book and pencils to be enough. Just one man doing all the cooking and serving. Service is slow but food is nice. We were the only ones there and could not book ahead as he did not answer his phone. Nice hot pot meals, relatively quick service. Private small rooms. We had a little cosy room to ourselves where we cooked two hot pots in front of us. This was a little tricky with a three year old who just ate the rice, we had to be hyper vigilant around the hot flames but we managed and the older kids enjoyed the cultural experience. Good for a large group upstairs. Sushi is good. Service is good. We had 35 at dinner and could be noisy and served quickly and couldn’t eat everything. This was our most expensive meal bill. We are still eating baked beans and toast a month later to recover. Several theories surfaced as to whether other tables were putting their beer orders onto our table number! Good for large groups, especially loud ones! 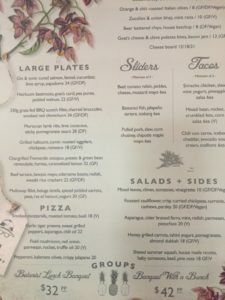 Terrible menu, so-so service, delicious food. Some of us found it challenging to sit on the floor for such a long time and the waitresses didn’t anticipate how thirsty everyone was but somehow it all worked out, we ate here twice. Very expensive but nice food. We chose the cheapest set menu and had to divide up the children’s food as none of them liked anything put in front of them besides the rice and fried chicken. When all else fails, White room across the road from the gondola serves cheese toasties, edamame beans, hot chocolates and fries. Next Article Skiing Accidents. Would You Know What To Do?